We have everything for your painting needs! We are your one-stop paint, stain and adhesives center! Our expert paint staff can computer-match your paint sample, ensuring a perfect finish every time! Come check out our premium products such as Valspar, Clark & Kensington, Benjamin Moore, Ace Royal, and Zinsser for all of your painting needs as well as a variety of preparation and application tools to get your job done right. The first step in choosing paint for your home is to select the main color for each room. This comes down to a variety of decisions about the emotions that you wish to evoke. This short tutorial will walk you through selecting a hue, saturation level, and talk about the effect of using undertones from a different color. Selecting an exact shade of color for your walls can be a difficult process. In this tutorial we discuss ways that wall color can change the ways that we perceive other colors in the room, room size, and room lighting. Using the correct palette can help to create a harmonious and comforting atmosphere for your home. In this short tutorial we discuss the process of choosing complimentary colors to accent your room. When beginning your painting project, it is important to select the right tools. In this tutorial we discuss roller frames, roller covers, extenders, paint trays, and brushes, including a discussion of what size roller nap is proper for various surfaces. A sloppy paint job will definitely stand out – and not in a good way. When it’s time to paint a room, take a little time and do it right. 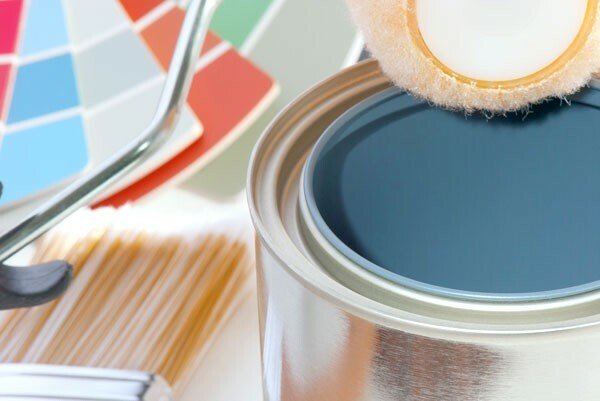 Remember the five Ps – Prep, Patch, Prime, Paint, & Paint A Second Coat. This quick tutorial will walk you through the vital steps to make sure that your paint job stands out for all the right reasons. This quick tutorial walks you through the steps of cleaning up after your painting project, including how to clean up spills and splatters, how to properly clean your brushes and rollers, and how to correctly store your unused paint. Wall graphics can be a great addition to any paint job, but your project can easily fall victim to jagged lines, bleeding colors, and other issues. Follow the six simple steps in this tutorial to make sure that your wall graphics are perfect every time. Painting a door can be a great way to bring a new splash of color to your home. Follow the steps in this tutorial to properly prepare your door for painting, including making sure that the surface is smooth and ready to receive paint, and selecting the proper paint product for your door’s material. This short tutorial explains a couple of common household furniture fixes, including how to remove water marks left over on wood surfaces from hot or cold beverages and how to repair wobbly chairs. This tutorial explains the proper method for applying an even coat of spray paint to an object, including proper distance, spray patterns and overlapping spray techniques to make sure that you don’t get a drippy or inconsistent paint job. Caulk has dozens of uses around the house, from sealing off drafts to stopping water leaks, even keeping pests out. That makes the caulk gun one of the most helpful tools that you can have. Here’s how to use one. Patching a hole in drywall is something that you can do yourself. You just need a little advice and the right tools. And if you do it correctly you won’t see the patch at all. This brief tutorial will show you the proper steps to a flawless fix. Why let one cracked or broken tile ruin the look of your whole floor when it’s simple to fix. This tutorial will walk you through the steps of removing the old tile, clearing the surface of old grout and debris and installing a new tile. When your blacktop driveway is fading to gray, a fresh seal coat will protect it and get it looking new again. Plan ahead. If you have large holes to fill you’ll need to allow time for your patch product to cure before you put on your seal coat. Follow the instructions in this tutorial to properly prepare and apply the coating. Your deck is more than just a place to spend time, it’s an investment. Take good care of your deck by properly cleaning and sealing it against the elements.